Hasini offered to hold up Yuvi’s arm while I gave him his bath today. Hasini amazes me often with a kindness that belies her age. My little boy fractured his arm last weekend playing on the bed and is now running around with his arm encased in a heavy plaster of paris cast. I’ve been buying him lollipops and toy cars and I let him wear his favourite jeans every day. But I’ll probably never forgive myself for letting it happen. I’ve slowed down, watching my every step, watching his every move, checking and rechecking that all the little fingers and toes are well inside before shutting the car door, moving the bucket from underneath the tap (he likes to take a dip in the bucket). I’ve pushed aside the malpua and linzer cookies and ignored my blogging calendar. I make him his favourite poached egg korma and mini idlis almost every day now. This Kara adai was almost a month earlier. Knowing him, I did not expect him to really eat it but I was surprised that he enjoyed it. This is my ammama’s Kara Adai recipe. It must be one of the simplest Adais out there with the fewest ingredients. 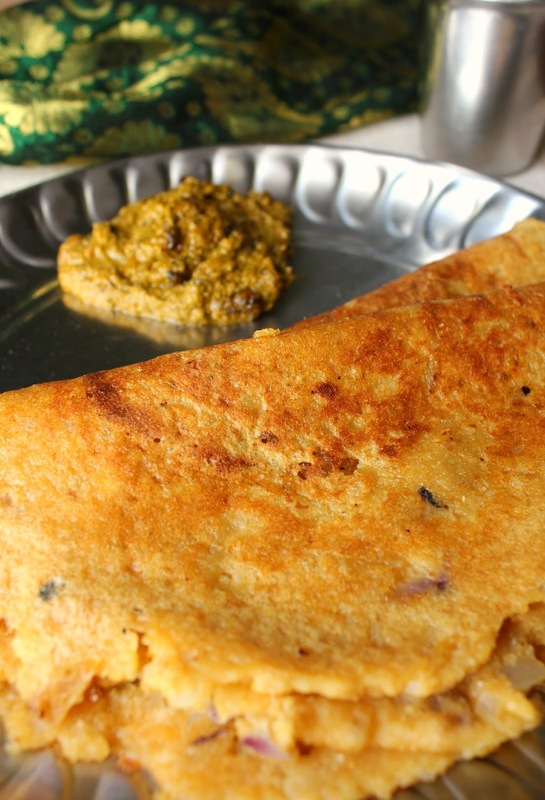 This Kara Adai is my favourite Adai over all the other multi-dal grated coconut mixed Adais. It is simple and delightfully tasty. I prefer my Adais on the thinner side bordering on crisp but you could make the Adais however you like them. The fried onions however are not an option. The fried onions are what make the Kara Adai what it is. 1. Rinse toor dal and rice in 2-3 changes of water till the water runs clear. Then soak for about 2 hours. 2. Once soaked, drain the water reserving it for later. Grind the dal and rice in a mixie to a coarse paste adding the reserved water to help along. 3. Transfer the ground rice-dal batter to a vessel. Add salt and red chilli powder and mix well. Set aside. 4. Heat 2 tbsp oil in a pan and add the chopped onions. Fry till they turn translucent. Remove the fried onions and mix them into the Adai batter. Mix well. The batter should be thicker than the idli batter and should flow easily but should not be too runny. 5. Heat a tawa, ladle some adai batter on the tawa and spread with the back of the ladle to make an adai of desired thickness. 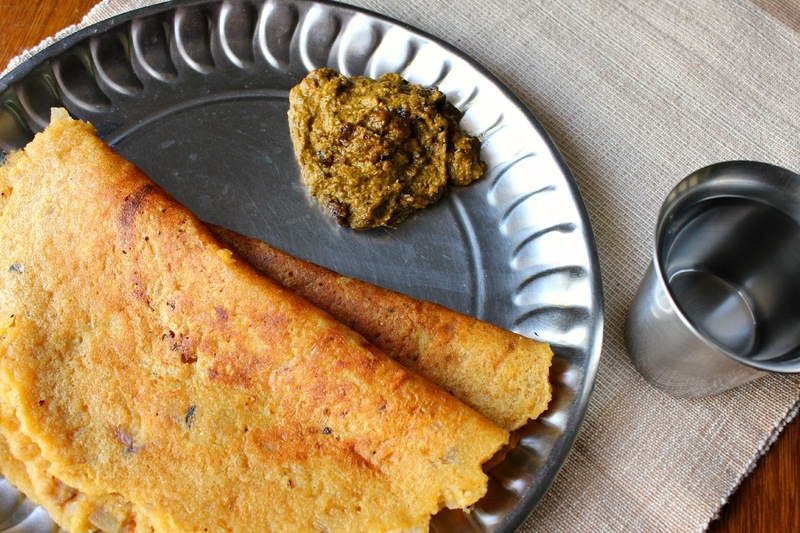 Drizzle one teaspoon oil all around the edges of the Adai. Cook on medium low till the underside is nice and golden. Flip over, drizzle another teaspoon of oil all around and cook for a further 1-2 minutes. Remove on to a plate. Serve hot with any chutney. 1. Make sure the batter is coarse and not totally smooth. 2. Always cook Adais on medium low heat. You may need to cook them for 2-4 minutes. Be liberal with oil. 3. I always prefer adding fried onions to the batter. You could stir in chopped raw onions if you wish. But fried onions add a note of subtle sweetness and flavour that is unparalleled. 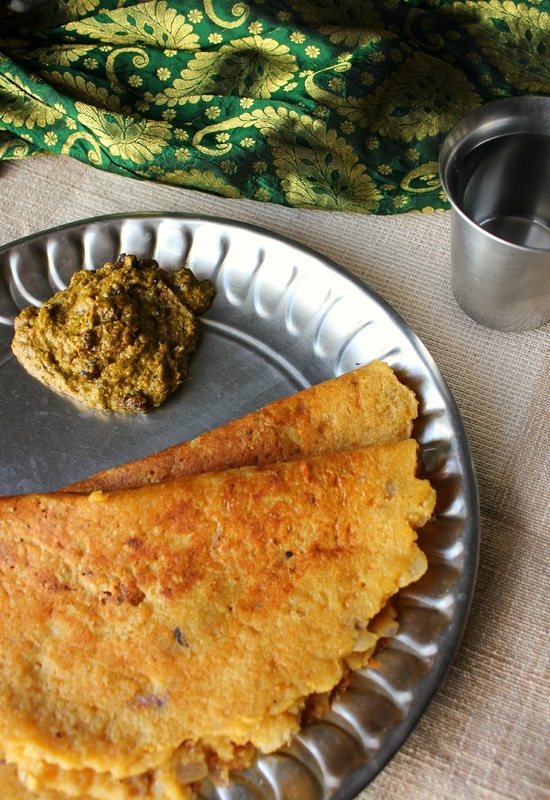 This entry was posted in Tiffin / Breakfast and tagged easiest adai, easy adai, kara adai, lentil dosa, recipe, south indian tiffen, south-indian breakfast, tiffen, toor dal adai.